Broken Cam caps are common in performance applications due to the factory cast aluminum cam cap which is very weak along with a thin cross section. Increased valve spring pressure is usually to blame caused by aftermarkets valve springs. Did you know that when you increase valve spring pressure by 50lbs that the camshaft has nearly 100lbs of upwards pressure trying to force the camshaft out of the cylinder head! This is due to the follower/rocker arm ratio. The MMR cam caps are produced from aerospace Billet Alloy and feature increased cross sectional thickness to handle the highest of valve spring pressures. Increased stiffness means better performance and less loss through cam caps that are flexing upwards loosing valuable camshaft lift. Camshaft Line boring is required with these. The tool is available for purchase or you can send your cylinder heads in for MMR to complete this labor. Please click on the options below. If you have had a rear cam cap break, you MUST check the camshaft for run out. When the rear cam cap fails the cams can and will bend because they are unsupported. Failure to check this can and will damage the cylinder head again! Includes 8 cylinder head caps for 1 cylinder head (front cap does not require replacement because there is no upward force exerted upon it, this is because the timing chain is constantly pulling it down towards to crankshaft as the engine turns. Integrated Dowel with tighter tolerance to locate cap better under extreme pressures. 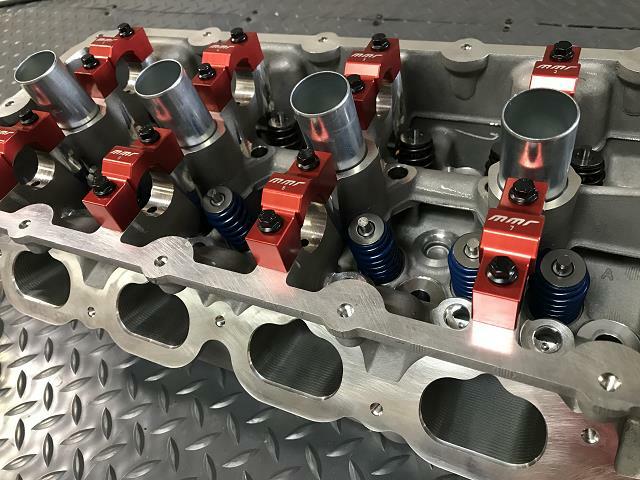 More details and pics of the MMR Billet Coyote blocks !! Vendor Announcement!!! Looking for aftermarket parts for your coyote, MMR stocks MMR & Ford Racing Parts! !